Addison Pest Control is the fly specialist. We have never failed to eliminate a fly infestation. 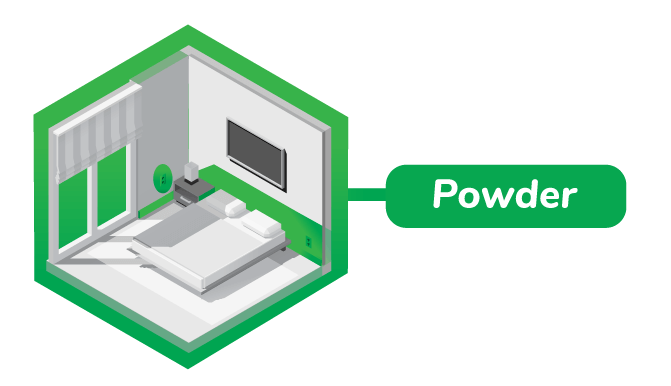 Electrical items, such as a power bars are treated with powder. Cuts up the abdomen of adults and larvae. Coats the insides of the wall cavities to create a protective powder barrier around your home or apartment. No flies can spread to or from attached houses, adjacent apartments or condo units. A fine mist of residual spray is applied to kitchen and bathroom cabinets, around light fixtures, window sills, baseboards, door jambs and floors throughout the home. Kills flies on contact and remains active as a protective surface treatment to continue to kill flies as they come out of hiding. Keeps your home protected for up to 6 months. The tip off is when they offer to do a “follow-up spray” two weeks after the first treatment. While this may seem extra thorough, flies can remain hidden, or new flies can continue to emerge from their pupae for several weeks after the first treatment. These budget services can breed pesticide resistance in the flies in your home, making future treatments increasingly challenging. If you suspect you have a Fly infestation clear and complete information is the first step to getting rid of them. Here are a few facts, myths, and tips that will help you to make a well informed decision about what to do next. House flies are one of the most widely distributed species on the planet. With highly adaptable eating habits, a fast life cycle and highly tuned sensory organs, the housefly can invade and infest almost any home. How to Identify House Flies? red, compound eyes consisting of thousands of lenses for a full field of vision. Female house flies tend to be larger than males. Complete metamorphosis: egg, larva (maggot), pupa and adult. Female lays each batch of 75-100 eggs in humid, high protein organic matter. she lays up to around 500 eggs in a lifetime. In warmer climates and under ideal conditions, rice-like eggs (about 1.2 mm) can hatch into larvae in 12-24 hrs. The legless white maggots are 3-9 mm long and remain in the egg breeding site, feeding and moulting four times. Pupate in a dark place for 3-6 days and emerge as adults capable of reproducing 2-3 days later. typical lifespan in the wild of about a month. How do I know if I have a house fly infestation? Pupae are usually tough to find but may be discovered near the breeding material. Inside your home, adults often rest on walls and ceilings during the day and can be found closer to food sources at night. How did house flies get into my home? 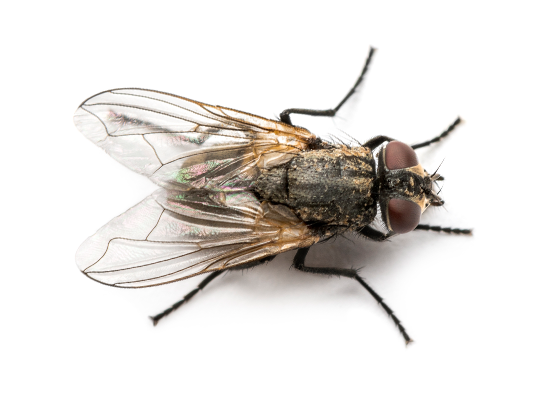 House Flies can also find their way into your home through open windows when in search of food, the interior and exterior of your property should be searched for harbourage material; dog faeces should always be picked up. How Serious are House Flies? House Flies have been found to be vectors of E.coli, Campylobacter and associated gastrointestinal illnesses and they can even transmit viral hepatitis A and E in addition to the eggs of parasitic worms. Common House Flies do not bite, but they are commonly confused with female Stable Flies which require a blood meal before laying their eggs. Can I get rid of House Flies on my own? At Addison Pest Control our goal is to remove an infestation as quickly as possible and keep your home fly free for good. No pest control method is perfect. With our three-part treatment, each method compensates for the shortcomings of the other. This approach yields quick and dependable results in eliminating house flies. dispose of pet faeces promptly and remove any carcasses or waste from your outdoor spaces. Keeping your property free of potential breeding sites is the most effective preventative measure against all domestic flies. How do you get rid of Phorid Flies? What do phorid flies look like? The legless cream coloured maggots are 1-8 mm long and remain in the egg breeding site, feeding and moulting three times. How do I know if I have a phorid fly infestation? How did phorid flies get into my home? Phorid flies can also find their way into your home through open windows when in search of food, the interior and exterior of your property should be searched for harbourage material; dog faeces should always be picked up. What do Phorid Flies eat? How Serious are Phorid Flies? Phorid Flies have been found to be vectors of E.coli, Campylobacter and associated gastrointestinal illnesses and they can even transmit viral hepatitis A and E in addition to the eggs of parasitic worms. Can I get rid of phorid flies on my own?